There must be something in the water in Austin, because every baby we meet lately has got a very full head of hair. And who can resist a newborn child with a full head of hair? But the incredible ‘do on this particular baby girl is not the only reason this collection makes our hearts sing. We just love the simple perfection of the styling. Simple is beautiful. Simple is sophisticated. And we believe that this is true particularly when we’re photographing newborn babies and their new parents. Let’s talk about all the styling choices in this session, and why we think it works so beautifully. The wardrobe options are all very basic, uncomplicated pieces, either in solids or with subtle patterns in muted colors. 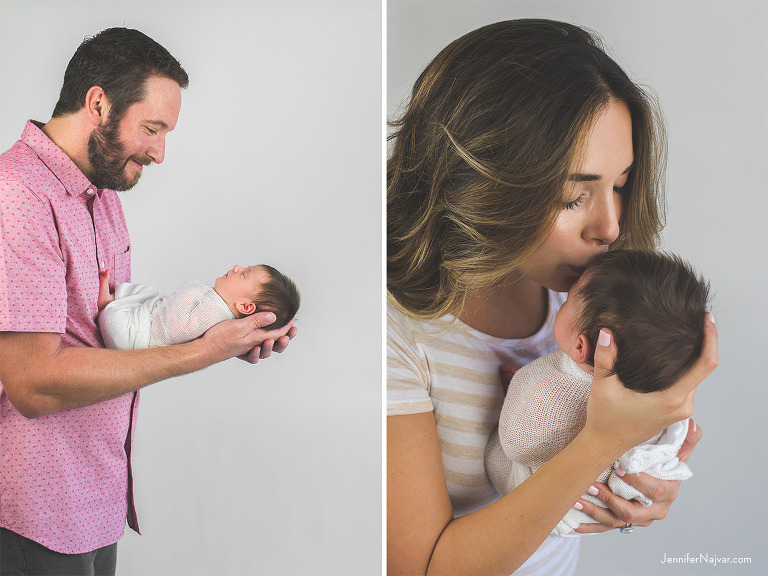 With a newborn, the colors introduced by the parents’ choice of wardrobe really dictates the decisions we make throughout the photo shoot. Being intentional with a limited color palette and keeping it consistent throughout the shoot — white, light blue, shades of pink, and tan, in this case — is really important if our goal is to create a cohesive set of images. Our use of props is minimal, but where we did incorporate a wrap or blanket, we extended the same limited color palette with white and blush materials, and tried to be intentional with the selection of head pieces, keeping them coordinated but modest and understated. 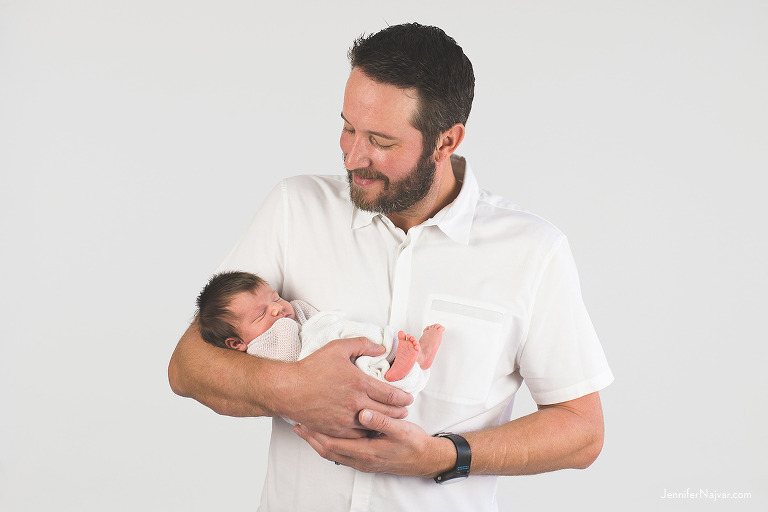 The solid white backdrop is a staple in our newborn parent portraits, because we love the simplicity of a clean, modern look. 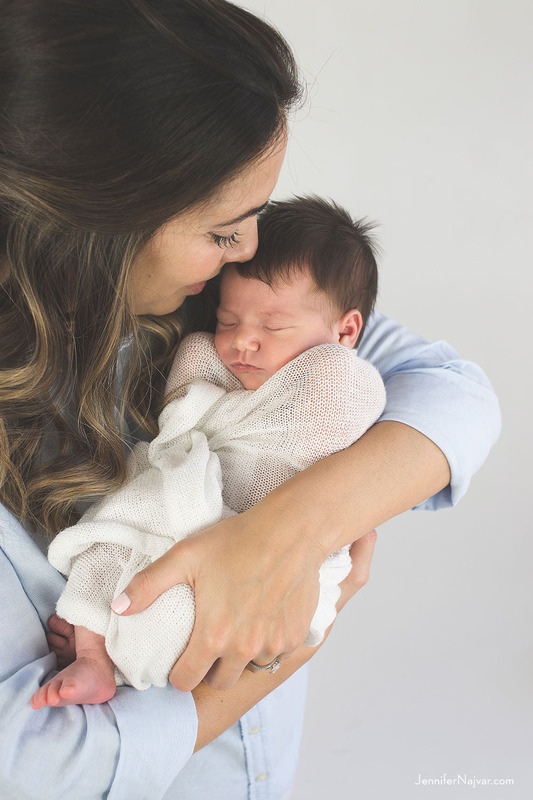 This shoot is a perfect example of simplicity in styling and a great inspiration for families planning their newborn portraits. We like to encourage clients to approach their own shoot through the lens of simplicity, and we think the results will be gorgeous every time.